EMU GDP growth logs a finalized 0.7% annualized quarterly pace in Q3 2018 while its year-over-rate is cut back to a 1.7% gain from Q2's 2.2%. GDP growth in the EMU has steadily decelerated. The table highlights the slowing down of GDP growth rates as a broad-based euro-phenomenon. Year-over-year growth rates diagnose trends best and have some stability to them. On that basis, the EMU decelerated in each of the last four quarters in the region as a whole. In addition, among the eight early reporting EMU members, six show year-on-year GDP slowdowns in Q3 compared to Q2. Seven show GDP slowing in Q2 compared to Q1. Seven also show GDP slowing in Q1 compared to Q4 2017. In Q4 2017, only Portugal and Italy showed slower growth than in Q3 2017, but overall EMU growth slowed nonetheless. Among these last four quarters, Japan showed slowing in three of them and Japan actually logs quarter-to-quarter GDP declines in two of them. The U.K. and the U.S. buck the pattern of slowing with both demonstrating GDP acceleration in each of the last two quarters year-over-year and with the U.S. extending that streak to 11 consecutive quarters without having year-over-year GDP growth rates decline. U.S. growth accelerating has brought growth up to a pace of 3% year-over-year in Q3, but that will be hard to sustain with GDP already having decelerated in Q3 compared to Q2 on a quarterly basis. Also U.S. interest rates have been rising since end 2015 by a no significant amount and some impact on interest sensitive sectors already is apparent. But there is as yet no hint from the Federal Reserve that monetary policy will swerve from the path-to-normalcy of rate hikes that has been in place for some time under its program of forward guidance (SEPs-Summary of Economic Projections). Current U.S. GDP growth is impressive when compared to the EMU where the year-on-year pace topped out at 2.8% in Q3 2017. When that happened, both the Netherlands and Spain were pumping out strong growth rates with the Dutch rate at 3% in Q3 2017 (down from 3.3% in Q2) and the Spanish rate at 2.9% (down from 3.1% in Q2). 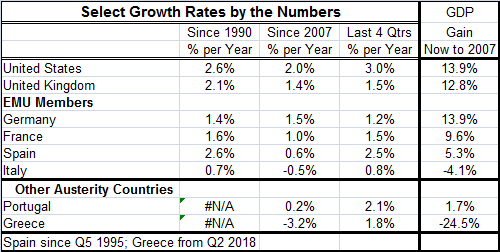 In Q3 2018, the top year-on-year growth rates come from Finland at 2.6%, Spain at 2.5% and the Netherlands at 2.3%. After these, only Portugal has GDP growth over the 2% mark in Q3 on a year-over-year basis. Germany logged a GDP decline in Q3 2018 with a drop at a 0.8% annual rate. Japan also has stumbled and contracted at a 1.2% annual rate. In Japan, the stumble was more the result of a culmination of several extreme natural disasters that pummeled the economy. Germany on the other hand has been showing weakness in both its manufacturing and service sectors for some time but not enough to suggest that contraction in GDP was in play. The German economics ministry says that international trade had become a drag on growth in Q3 but also cited problems at automakers in getting approval for sales under new tougher German emissions standards. Still, Germany faces a host of issues; not the least is its transition from a strong Merkel-led government to a period of political probing and instability as new leadership is sought. Meanwhile, Italian growth expands at an annualized quarterly pace of just 0.1% in Q3 2018. Italy continues to defy the EU Commission over its fiscal plan and the EU Commission has demanded changes. Italy is far from the first country to be asked for policy changes by the EU Commission, but it is the first to really stick its heels in the ground and to defy the Commission (in an earlier period deficit violations by Germany and France were 'forgiven' by the EU Commission). Greece, of course, had a long disharmonious relationship with the Commission but as a small member was not in a position to really defy it. Italy is one of the four largest economies in the EMU and an important defining European member. The poor performance of the Italian economy is a wake-up call for all of the EMU. Except the euro area has continued to hit the snooze button and refuses to wake up. The level of Italy's GDP is still some 4% below its level in Q3 2007 ahead of the onset of the global financial crisis and economic slowdown. Clearly, the EMU arrangement has worked well for Germany. Its performance has been the equal of that of the U.S. over this period although it has lagged the U.S. since the financial crisis. For Italy and Greece, it has been a disaster with GDP failing to grow and in fact shrinking. For Portugal, GDP is higher since Q3 2007 by only 1.7% compared to Germany (and the U.S.) with gains of 13.9%. The Italian economy is 4.1% smaller on this timeline and Greece is smaller by nearly 25%. An economic system with no federal transfer arrangement that allows such disparate economic performance among members surely is not a system that will be stable. The sort of acrimony we see in Italy is simply to be expected. We are hearing far fewer choruses these days that 'we are all European.' Very clearly from the table it makes a difference if you are a European German or a European Italian or a European Spaniard or a European Frenchman and so on. The EMU/EU has not begun to sort this out. When the U.K. bristled over migrant rules that the U.K. found intrusive, the EU response was inflexible and the U.K. opted out. Now with the Italians needing - really needing - some fiscal flexibility the EU Commission say 'no.' It does not bend. It does not look at the facts on the ground; it just looks at the rules. Surely, this is no way to run a railroad, but it is a way to rail road members. We can look for sparks to continue to fly in Europe and wonder exactly what will catch fire as a result.